well, the ride is finally complete. 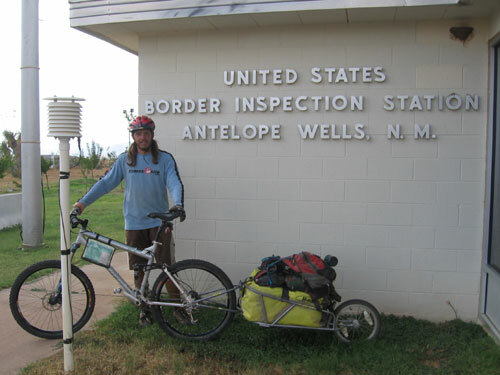 i arrived in antelope wells, new mexico on wednesday, september 28th after 59 days and over 2,400 miles ridden. the ride was a once-in-a-lifetime experience with many great highs and a few days that i would just as soon forget. i will post up all of the pictures that i took along the trip when i get a chance, but i just wanted to let everyone know that i was done and finally back home. i made it to del norte, colorado. three 10,000 ft.-plus mountain passes in the past four days and an incredible headwind have not been very fun. tomorrow is the big hard day though: 23 mile climb up to a 12,000 ft. mountain pass. but only a few more days in colorado and then i will be in new mexico and almost done. i have a 5-day stretch out in the woods coming up, then one day going from abuiqui to cuba, then a 3-day stretch from cuba to grants, and then a desolate 6-day stretch from grants to silver city. from there, i only have three days of the ride left until i reach the mexican border. since i will be out in the woods most of the time from here on out, this will probably be my last post before the trip is over. just wanted to let you all know that i was still going and not dead. today i am in steamboat springs, colorado. i finished up wyoming yesterday and so now that is three states done, two to go. i am actually over half way as far as mileage goes - i have ridden over 1300 miles so far. i am going to take a couple of days off while i am in town and hopefully get rested up for the remainder of the ride. i am glad to be out of the desert and back in the forests, but that also means that the big hills are back. i have several continental divide crossings over 11,000 feet coming up in the next few weeks, so i am not looking forward to that. but, i have made it this far so i guess i just need to keep pedaling and i will be in antelope wells before i know it. thanks for all of the comments and support from everyone.